Just because your pet has fur all over its body doesn’t mean that winter poses no threats for him. In fact, pets have many of the same needs that people do when it comes to staying safe from the effects of ice, snow, and cold–and you may need to shorten the length of your walks in order to ensure that cold-weather exposure doesn’t get too intense. Here are some of the ways you can look after your pup in wintry months. Keep the temperature comfortable for you and your family. If you let the temperature drop to save money, you can always bundle into a sweater – but your dog will have trouble getting warm. Your dog could be susceptible to illness, arthritic pain, and other cold-related problems if they can’t get and stay warm. If you have cats, be sure they don’t sit on or too near heating elements; block heaters with a screen if it helps. If needed, use a humidifier to keep indoor air from getting too dry, and be sure your dog stays hydrated–a bubbling water fountain can encourage a reluctant pup to get enough water. Adequate internal and external hydration will keep your pet healthy and prevent their vulnerable noses and paws from cracking or bleeding. Make sure any bedding that your pet uses is clean, dry, and comfortable. It should be regularly washed and dried to prevent mold and mildew. If your dog’s bedding gets wet, they’ll get too cold and could suffer hypothermia. Lisa Wagner, Operations Director of Walks ‘N’ Wags Pet First Aid, suggests considering your pet’s limitations. If it’s snowy and/or below freezing outside, smaller animals or those with little fur may only tolerate a short walk around the block. Be sure your pet is warm enough to go outdoors. They may need an extra layer to keep them warm. As dogs age, they have less muscle and fat to insulate them from cold. Small dogs may not have much insulation at all. Sweaters and doggy jackets could be just the ticket for a safe and comfy walk. Did your pet have a recent bath? Be sure they’re completely dry before you head out. You don’t want frozen fur or paws! Consider booties. They’ll protect your dog’s paws from salt and other chemicals used to melt snow and ice, and keep anything sharp or painful from embedding into your dog’s paws. Make sure they have a good grip, just like your winter shoes! Dry off your pet completely, especially before they curl up in their bed, which needs to stay dry. Use a towel and consider following up with a blow-dryer on a low heat setting, held at least a foot from your pet’s fur. Thoroughly check their paws and make sure they’re clean, dry, and healthy. Look for cold-weather damage, check between the toes for ice accumulation, and wipe off any street residue. 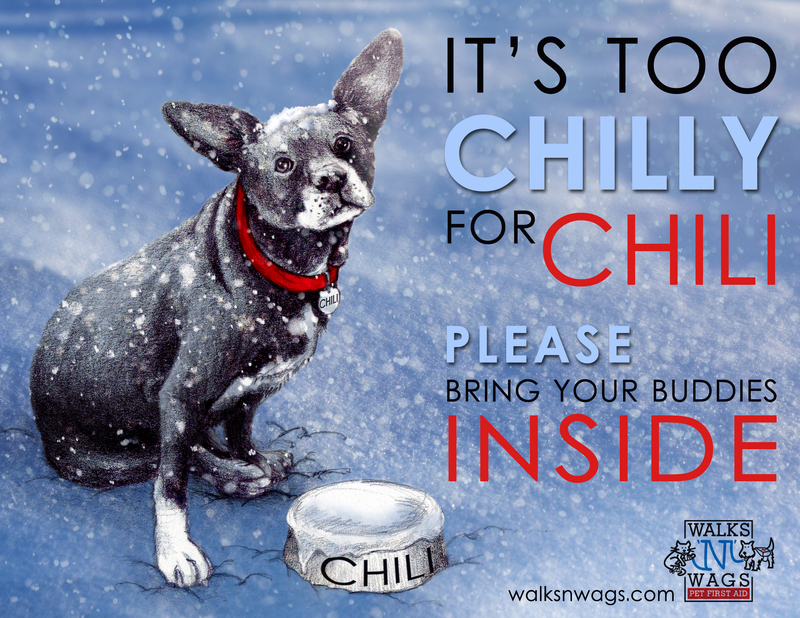 If your pet rolled around in a chemical ice melter or can’t seem to get warm, give them a warm bath. Don’t shift their body temperature too suddenly, though. If they’ve gotten very cold, start with cool water and gradually warm it up. Then stay with them until they’re dry, cozy, and comfortable–and keep an eye on their body temperature. If it’s not already in your pet’s diet, consider a fish oil supplement to be sure they’re getting enough fatty acids, which will help their skin and coat stay healthy all winter. Increase calories as the temperature drops, to make up for lost heat. Check with your vet to find out how much your pet should be eating in the winter. Need to travel during the winter? Find a trusted pet-sitter with cold-weather know-how at Rover.com. And if you’re looking for Pet First Aid training, Walks ‘N’ Wags Pet First Aid can help ensure your pet stays happy and healthy all winter long. No one says you have to do it all alone!